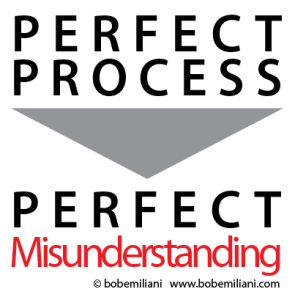 A few of the leading figures in the Lean movement have, for many years, talked about “perfect processes.” Unfortunately, this reflects a perfect misunderstanding of both the nature of processes and of waste (muda), and unevenness (mura) and unreasonableness (muri) as well. Let’s begin with the perfect misunderstanding of waste. The insidious nature of waste means that even so-called “perfect processes” are never waste-free*. Your eyes deceive you if a process looks waste-free. If you succumb to the deception, you will stop improving the process. Continuous improvement does not mean create a perfect process and then move onto another process, on a continuous (sequential) basis. It means to improve all processes, continuously. Kaizen is forever. We must remind ourselves that waste remains, no matter how good a process looks. Therefore, one must develop the skills to observe and find waste where none is evident. Now, let’s consider the perfect misunderstanding of processes. Things change. They change more often than we think and in ways that we often have difficulty perceiving. An operator may unknowingly do a small part of the work differently. A new operator joins the line. Customer demand changes. Product or service specifications change. Sources of purchased materials change. An HR policy changes. The lighting or noise level in the work area changes, such that workers miss a fine detail that helped assure quality. A new supervisor joins the team. The president of the company retires and the new president is a numbers person. And so on. The notion of “perfect process” has has even led some to imagine that it would be fun to create organizations free of waste, unevenness, and unreasonableness from the start. Fun? The new business would likely never get off the ground because of people arguing over what is a perfect process and how to make one. It would be better to start quickly with imperfect processes, even hugely waste-filled processes, and rapidly and continuously improve them. That will develop the human skills truly necessary for adapting to changing conditions. In contrast, the skills that might come from creating waste-free organizations from day one will not be useful because they are focused on day one, not days two through 10,000. But, you say, “The words ‘perfect process’ are an aspirational goal, not an actual goal.” Even as an aspirational goal, “perfect process” functions poorly. Does the obvious conflict between the phrase “perfect process” and “continuous improvement,” which never ends, misinform people or cause unproductive thought or unnecessary action? There is no such thing perfect processes and, therefore, there is no such thing as perfect value. * In order for a process to be free of waste (and unevenness and unreasonableness), it must contain zero waste for each one of the eight-plus wastes. This cannot happen. Zero overproduction is not possible because lead-time is greater than zero. Zero waiting is not possible because of queue-time is greater than zero and the existence of defects that stop the line. Zero transportation is not possible because WIP, parts, and products must be conveyed from one location to another. Zero processing is not possible because specifications are imperfect. Zero inventory is not possible because processes require standard work in process in order to function and due to the distance between the source of demand and the source of supply. Zero (excess) motion is not possible because workers make small errors and cannot be stationary for an entire workday. Zero defects is possible for discrete periods of time, but not possible for all time. Zero (waste) behaviors is not possible because people are not perfect. Your last three paragraphs don’t really hold up to a magnifying glass though. What exactly is the “obvious conflict between the phrase ‘perfect process’ and ‘continuous improvement'”? I think it is a conflict easily resolved with the understanding that perfection is never achieved. It is meant to challenge and stretch people to attempt to achieve the impossible. It is also meant to drive people to never rest on the accomplishments of their past. The point is to define an unattainable process that will never happen and then work forever in order to attempt to achieve it. All of this aligns perfectly with Respect for People/Humanity. To do anything less than to pursue perfection would be the insulting thing. To waste a persons life in pursuit of the average would be the least respectful thing you could do. Not sure why I am writing this since you suggested ignoring anyone who disagrees with you…. I see… I did not intend for that to be interpreted as ignoring anyone who disagrees with me.